The PIC16F1xxx Enhanced Mid-Range 8-bit PIC®MCU Family spans a wide array of memory sizes and I/O pins. 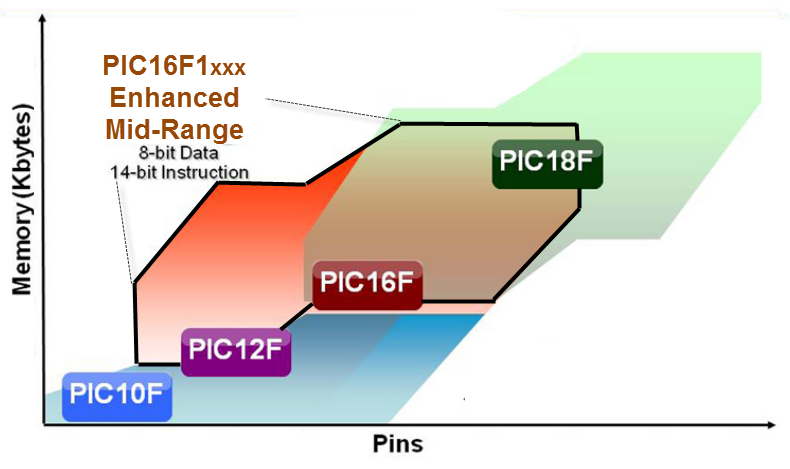 This page presents the key architectural features of the PIC16F1xxx family of MCUs. Links are provided in this page to the technical details needed to implement applications on the enhanced mid-range PIC MCU family. 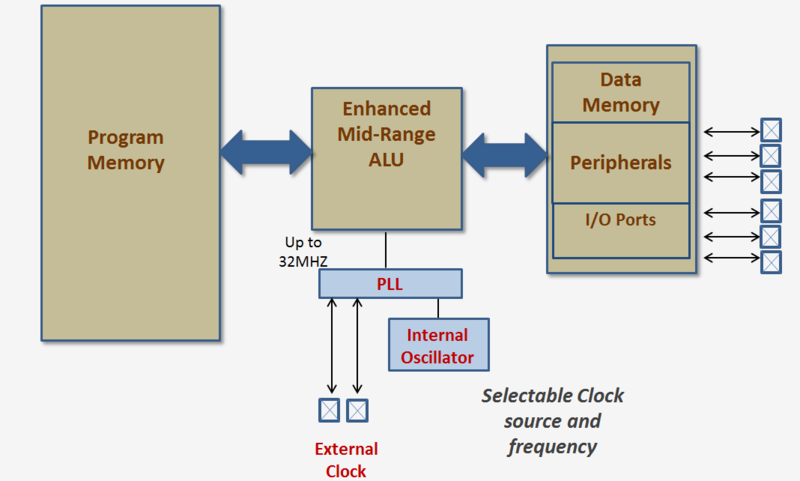 Enhanced mid-range PIC® MCUs use a dual-bus Harvard Architecture. An 8-bit data bus connects the ALU to the Data Memory space. During each instruction the ALU can read data from data memory location, modify the data, then write the data back to memory. A closer look at the Data Memory section of the enhanced mid-range PIC®MCU shows the registers controlling the peripherals and I/O ports are accessed by reading or writing to specific data memory addresses. This mapping of peripherals to memory address greatly simplifies learning how to program the enhanced mid-range PIC. Enhanced Mid-Range PIC® MCUs each have 49 instructions. Instructions directly accessing Data Memory addresses execute in one instruction cycle. 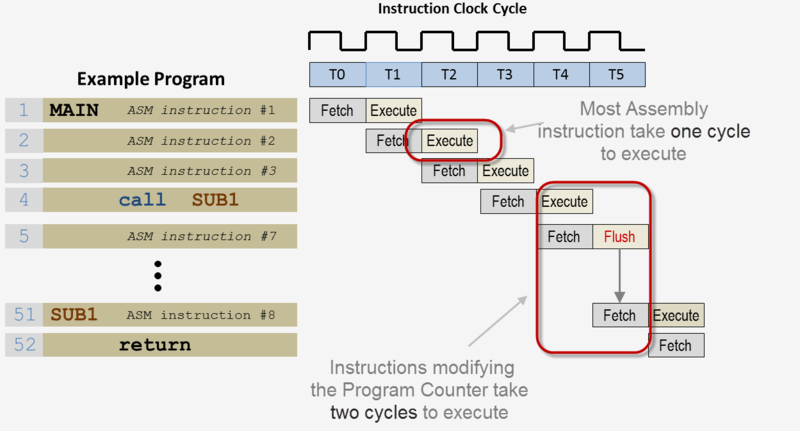 Instructions which cause a change in the program counter BRA, GOTO, RETURN, CALL, ..etc) take two instruction cycles to execute. By mapping the I/O and peripheral registers to memory addresses PIC MCUs do not need special instructions for I/O operations or to set peripheral registers. 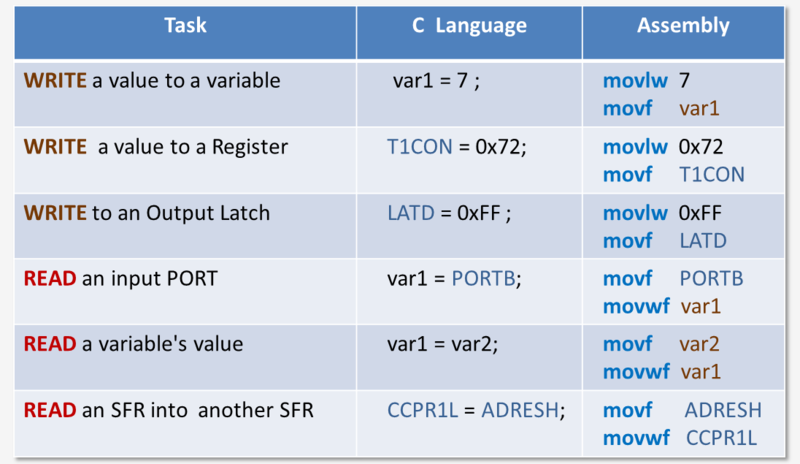 Writing to an I/O port or configuring a peripheral is a simple write to a memory location. 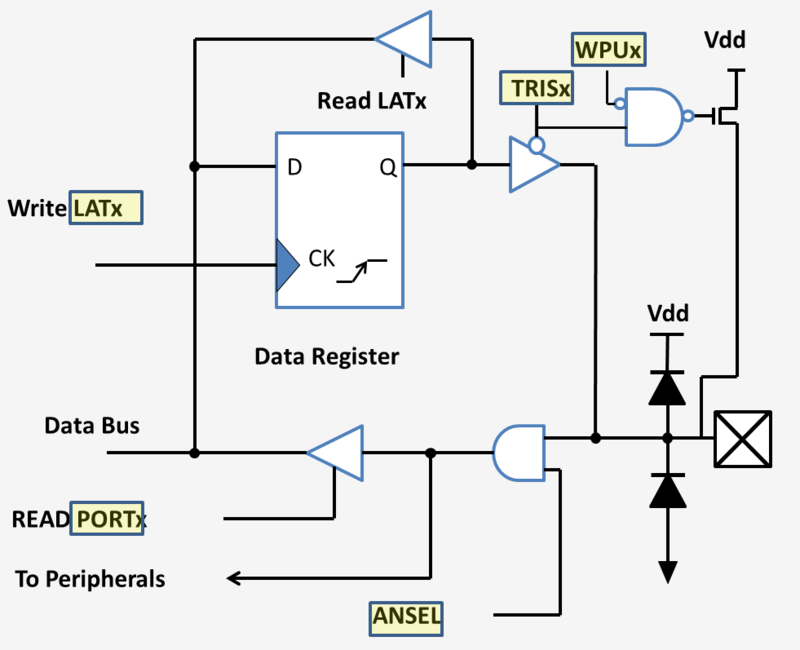 Reading the value of an input pin, ADC result register, or timer is a simple read of a memory location. By using a small number of orthogonal instructions Enhanced Mid-Range PIC MCUs are easy to program, use less silicon to build, and consume less power. For a detailed list of the instruction set and a full discussion of instruction timing please consult the Instruction Set page of the Enhanced Mid-Range tutorial. Clock Switching - The system clock source can be switched between external and internal clock sources via software. For a detailed description of the oscillator configuration options please refer to the 8-bit Oscillator page in the Enhanced Mid-Range Tutorial. 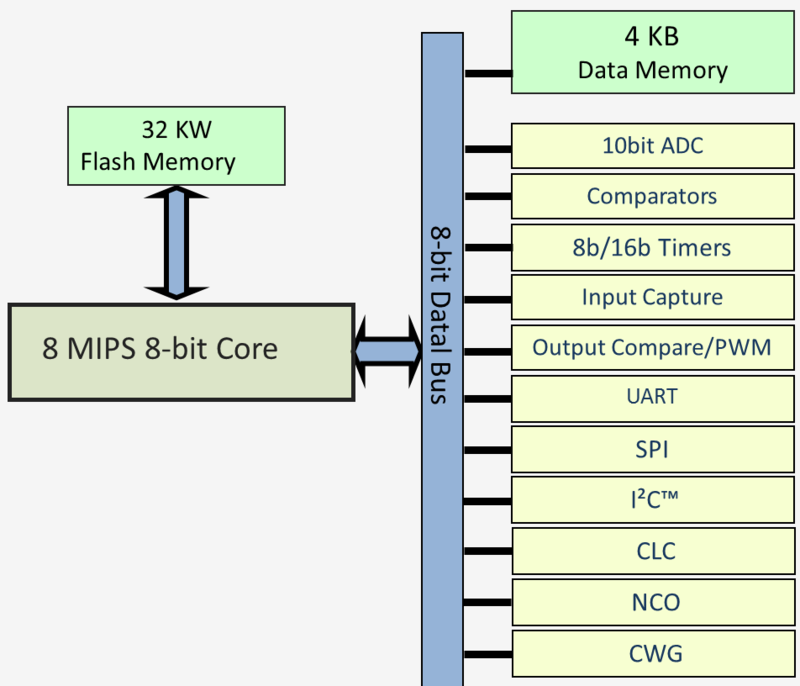 In addition to being configured as digital I/Os, pins on enhanced mid-range PIC MCUs can have several possible functions. The pin diagram on the datasheet shows the options for each pin. At start-up the program has the option of configuring the pins. In addition to digital I/O enhanced mid-range PIC MCU family members have an assortment of advanced peripherals. These peripherals include peripherals for data conversion, communication, and signal conditioning. Enhanced mid-range PIC MCUs utilize a single vector pre-emptive interrupt structure. Each peripheral on the PIC is capable of generating an interrupt request. When an interrupt request occurs AND interrupts for the requesting device are enabled an interrupt will occur. The enhanced mid-rage PIC uses a 16 level hardware stack to store the current content of the PC when an interrupt occurs. The program context is saved in shadow registers and control is passed to program memory address 0x04. The user is responsible for writing the code to service the interrupt and placing the code at address 0x04. This Interrupt Service Routine (ISR) determines the source of the interrupt, then performs the necessary task to service the interrupting peripheral. An ISR's final instruction is the Return From Interrupt (RETFIE) instruction. When an interrupt occurs the Global Interrupt Enable bit (GIE) in the status register is disabled. This will prevent the an interrupt from being pre-empted by another interrupt. Upon executing a RETFIE the state of the GIE control bit is restored to its pre-interrupt value. For a complete description of the interrupt process and programming examples please refer to the Interrupt Section of the Enhanced Mid-range tutorial. There are several sources of a RESET on the enhanced mid-range PIC MCU. The RESET sources common to almost all applications are the Power On Reset (POR) and Brown Out Reset (BOR) due to a sagging power supply voltage (i.e. brown-out). There are several other methods for resetting the MCU including Watchdog timeout and directly accessing the MCLR pin. Program Counter is set to 0x00. After a RESET the instruction located at address 0 is the first instruction executed. The application developer is responsible for placing code into this address to 'boot up' the PIC. Microchip's MPLAB® XC8 compiler will insert the appropriate instructions to start-up the PIC and transfer control to main. Assembly level programmers will have to write the code to initialize the PIC and jump past the Interrupt Vector located at address 0x04. 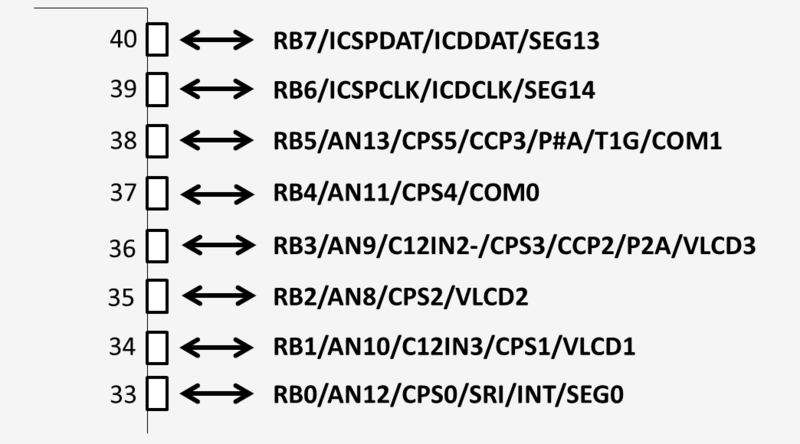 The datasheet for each enhanced mid-range PIC MCU shows the values which the registers will contain at RESET. The Programming Examples section of the enhanced mid-range tutorial provides programming examples of how to 'boot-up' the MCU.